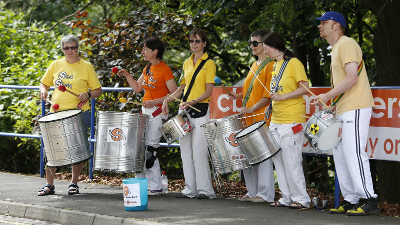 We are Huddersfield's community samba band. We're a drumming group that plays on Brazilian percussion instruments. We play traditional and modern styles of music from Brazil and everywhere. We're based in Huddersfield, in Kirklees, West Yorkshire. 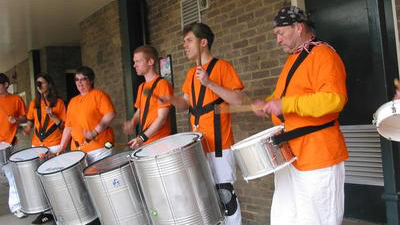 We're a community samba band so any adult can join. You don't need to have done any drumming or music before. Teaching is by example - you listen and copy. We also welcome experienced percussionists. 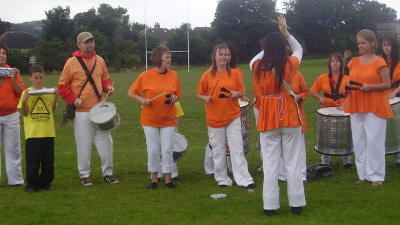 Come and learn Brazilian Samba and other drumming styles. It's fun. We perform regularly around Kirklees and occasionally further afield. You may have heard us at Marsden Imbolc or Slaithwaite Moonraking, or the Huddersfield St Patrick's Day Parade. We can perform at your event too. 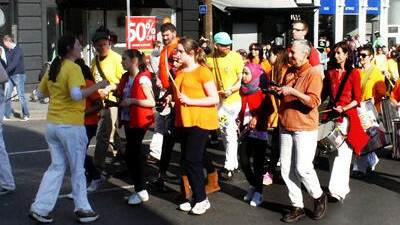 Slick Stick Sambastic is Huddersfields's community samba band. We were formed in 2005, and are made up from members of the local community. We perform at lots of events in and around the Kirklees area, spreading our funky vibe wherever we go. We play many styles of music including Rio Samba, Samba-Reggae and Ijexa, as well as fusion grooves and rhythms inspired by Afro-Cuban folkloric music, plus a helping of hip-hop and drum&bass. We are always on the lookout for new members, so why not come and join us? You don't need to read music as all the teaching is by listening and copying. We welcome absolute beginners and experienced percussionists. And you don't need an instrument because we have lots you can use. We practice in the Creative Arts building of Huddersfield University on Tuesday evenings at 7.30pm. If you'd like to come along, contact Susie info@slicksticksambastic or 07848 181616. 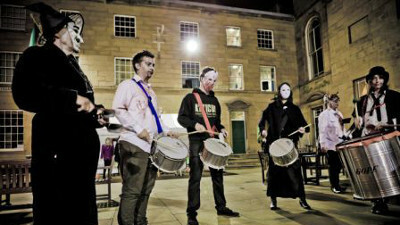 We practice in the centre of Huddersfield, in Huddersfield University's Creative Arts building. There's plenty of parking. Access to the building and the car park is secured, so call ahead to let us know you're coming and someone will meet you to let you in. Practice sessions are on Tuesdays from 7.30pm until 9.30pm. We don't practice every week so call or text Louise on 07900 262192 or email info@slicksticksambastic.com to check we're going to be there. The first session is free, and then £5 per session or £3.50 concessions. In this map the Creative Arts building is just to the left of the roundabout marked "Main Entrance and Exit". 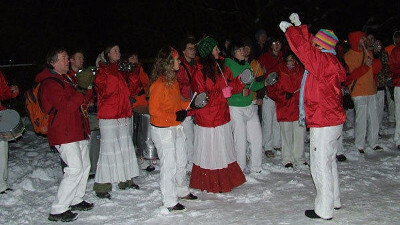 We've also performed at a lot of other events since we formed in 2005. To discuss your requirements for an event/gig please contact Louise at info@slicksticksambastic.com or 07900 262192. Performance fees are a vital part of our funding, enabling us to buy and maintain loan instruments and offer concessionary rates for sessions. Practice sessions are on Tuesdays from 7.30pm until 9.30pm. We don't practice every week so call or text Jude on 07870 291659 or email info@slicksticksambastic.com to check we're going to be there. The first session is free, and then £5 per session or £3.50 concessions.